The 80486, also i486 and 486, (pronounced eighty-four-eighty-six) was a family of 32-bit 4th-generation x86 microprocessors introduced by Intel in 1989 as a successor to the 80386. 486 introduced a number of enhancements to 386 including a new level 1 cache, better IPC performance, and an integrated FPU. 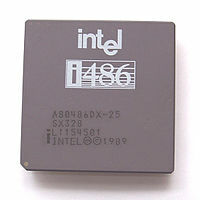 The 486 became the first x86 chip family to exceed one million transistors. Like its predecessor, the 80486 maintains full backwards object code comparability with the all previous x86 processors (80386, 80286, 80186, etc...). To improve performance Intel introduced a new layer of cache on-die (previously various external extensions existed). The 8 KB, 4-way set associative, write-back policy, cache was unified for both the data and instructions. This provided much needed faster access to recently used data and instructions. Various enhancements were also made to the bus interface including faster communication that required single clock cycle instead of multiple. Whereas before a separately packaged math coprocessor was used (i.e. 80387, 80287, etc..), the 80486 moved the unit on-die eliminating the external communication delays altogether. Furthermore more aggressive math algorithms were used to implement the new FPU yielding faster floating point calculations. The pipeline itself received some attention as well. Simple ALU register, register and register, immediate cached operations could now complete in a single cycle; this previously required at least 2 cycles. Facts about "80486 - Intel"
This page was last modified on 21 May 2016, at 02:01.